It was a bright, hot summer day, and perfect weather to enjoy the cool waters of a local pond. My best friend and I were having a great time enjoying a refreshing swim. We had been swimming for some time when I noticed that I was alone. Did my friend go back to the shore? I called out but there was no answer. Where did he go? I swam back to the last place I had seen him, and then I spotted him, motionless, two feet beneath the surface. I immediately went into action. It took every ounce of strength I had to tow him back to shore, and twice I went under myself as I struggled to stay afloat. Finally, completely exhausted, choking, and gasping for air, I hauled him to the shore. Immediately I began administering life-saving measures to my friend. Soon he began coughing, then breathing, and then the color returned to his face. My best friend was alive! Later on, as I sat by his hospital bed, he expressed great appreciation for what I had done. The events of that summer afternoon made a lasting impression on me. I had risked my life and extended my help to rescue my friend. Because of my efforts, he had physical life. A few years later I was a student in our ministry’s Foundational Class. In that class, I learned that God sent Jesus Christ to rescue me and that because of his heroic effort to redeem me, I have spiritual life. Jesus Christ didn’t just risk his life—he gave it completely in order to redeem me. God sent Jesus Christ to redeem mankind from death. As a result of his work, every born-again believer has the God-given sonship right of redemption. Building our understanding of what redemption is, and the reason for it, will help us have an even greater appreciation of this sonship right and enable us to respond more wholeheartedly to what we’ve been given. We were bought, or paid for, with a price. It is the price paid for our freedom and deliverance. The payment of this ransom, the price of our redemption, was arranged by our heavenly Father. We cost God something. God by way of Jesus Christ legally paid the price for man’s redemption so that everything mankind lost when Adam sinned was regained for the believer. It is satisfying and exciting to understand that our redemption is paid in full. There are no hidden expenses, and absolutely no further payment is required. 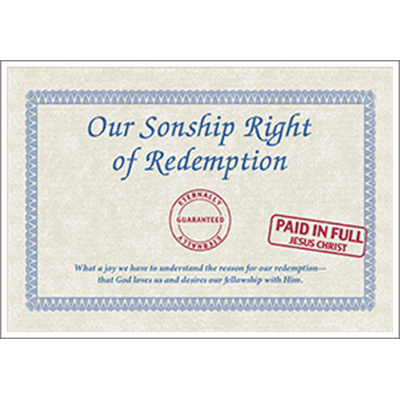 We have full legal ownership of our sonship rights, including redemption. Let’s look further in God’s Word to understand what this ransom payment was. How did God by way of Jesus Christ purchase the full redemption of man? In whom we have redemption through his [Jesus Christ’s] blood, the forgiveness [remission] of sins, according to the riches of his grace. The price of our redemption was paid by Jesus Christ with his own blood. The word “blood” is used here as a figure of speech referring to Jesus Christ’s giving of his life. Jesus did not pay this price for his own sins, for he himself had none. He paid for our sins. As a result, when we are born again, we have remission of sins: our sins are wiped out, forever cleansed from our account. This payment made on our behalf was complete. Our redemption is a complete and finished work. We can rest in the knowledge that every requirement to secure our redemption was fulfilled by Jesus Christ. Nothing was left undone. As a result of Jesus Christ’s work, we are completely redeemed. Spiritually speaking, Jesus Christ freed us from our debt of sin. Knowing this, we can walk with confidence and peace. Satan no longer has any rights over any believer because his ownership has been forfeited and his rights over the believer have been forever revoked. There is absolutely no control that Satan legally holds over any saved man. Jesus Christ is the head of all principality and power, and we are complete in him. If we only look at ourselves from a senses perspective, we may be tempted to feel that we are less than what God made us in Christ Jesus. But when we focus on Jesus Christ’s completed redemptive work and claim our sonship right of redemption, our confidence will soar and we can walk with God’s authority and power, putting Satan beneath us. This onetime accomplishment of Jesus Christ has a lasting effect. Here we see the extent of Jesus Christ’s completed work: redemption is eternal. Nothing in our past and nothing in our future will ever change what God wrought in Christ Jesus to secure our redemption. It is a right that is forever ours to claim. Have you ever purchased something	that has a lifetime guarantee? The first time I saw this claim on a product it seemed very impressive and gave me more confidence about its quality. I quickly discovered that such a guarantee is only as good as the company that promises it. Our redemption comes with an eternal guarantee promised by our heavenly Father, Who cannot lie, as Titus 1:2 states. Now that’s a guarantee we can trust! When we understand that our redemption is complete and that it is for all time, we can certainly walk with confidence and boldness. To better appreciate what we have in being redeemed, let’s consider what our prior condition was. We are exhorted here to remember our past condition, before we were redeemed. At that time we were “without Christ, being aliens from the commonwealth of Israel, and strangers from the covenants of promise.” Being an alien and a stranger doesn’t sound like a very good state of affairs. The children of Israel had covenants with God and the promise of His blessings as they fulfilled His Word to them. Before our redemption we had no part of those blessings. Verse 12 continues: “…having no hope….” Before our redemption we had no hope. Without God’s help and intervention, we were bound in a hopeless situation. Furthermore, we were “…without God in the world.” Being in the world without God is not according to His original plan for mankind. God put man on the earth to fellowship with Him. To be in the world “without God” really summarizes the dire situation mankind was in. This was definitely not God’s will for our lives, nor was it to our benefit. This was the work of the adversary, Satan, who is God’s archenemy. But God saw our need. In loving response He planned and arranged to redeem us, to buy us back for Himself. In whom we have redemption through his blood, even the forgiveness [remission] of sins. God met our need by delivering, or rescuing, us from the power of darkness. He rescued us from the rulership of Satan and gave us citizenship in His kingdom. Furthermore, it was Jesus Christ whose blood was shed and who gave his life. God’s dear Son paid for our sins and caused them to be remitted. We were changed from being aliens and strangers to having spiritual citizenship in the Kingdom of God! These verses tell of our redemption and how God wonderfully and successfully responded to our need. Let’s see more of what God did to respond to our need. Remember that in time past we were without God in the world? Well, thanks to the redemptive work of Jesus Christ, things have really changed for the better. We were once far off and now we are near. We were once separated from God, and now we have direct access to Him. God met our need by setting us close by with open access to Him. Because of our redemption, we can walk in fellowship with God while living in the world. Let’s look now at why God responded to our need and carried out a plan to redeem us. The reason is that God loves us and desires our fellowship. God loves us with great love. Because of that great love, we have His abundant mercy. We were in an unfavorable position separated from Him by sin. But instead of passing judgment against us, He gave us remission of sins, eternal life spiritually, and made us sit together in heavenly places in Christ. The Greek word for “commendeth” in this verse means to place or set together, to introduce to one’s acquaintance and favorable notice. God favorably introduces us to His great love with the sacrifice of His Son for our redemption. The reason for our redemption is love, God’s great love. Behold, what manner of love the Father hath bestowed upon us, that we should be called the sons of God…. God not only introduced His great love to us by sending His Son Jesus Christ to redeem us, He also bestowed His great love upon us by making us His sons. To bestow means to give. God gave us sonship. Men and women, young people and adults, like you and me who are sons of God can have the closest possible fellowship with our heavenly Father because we are His children. God’s desire to have children that He can love and fellowship with is the reason He met our need and obtained our redemption. As we begin to understand God’s love and desire for fellowship, our natural response is to love Him and seek His fellowship. And walk in love, as Christ also hath loved us, and hath given himself for us an offering and a sacrifice to God for a sweet-smelling savour. We are beloved and dear children of God. When we consider His redemptive work to put us in such a favorable and blessed position, our heart’s desire surely is to return His love, to walk for Him. We want to give of ourselves in service to God as Christ also loved and gave himself for us. Our response to God’s love is to walk worthy of the Lord and to please Him. The word for “pleasing” used in this verse means a very great willingness to please and having every kind of pleasing attitude. This describes how a son of God responds to his Father’s love. It is indicative of those who understand and appreciate God’s redemptive work accomplished on their behalf. When we know the truth, we carry a good attitude and a great willingness to please Him. We put our whole hearts into the work He directs us to. In Luke 1:68-79 is the prophecy of Zacharias regarding God’s redemption of Israel and how God would deliver His people. Today God has delivered us. He paid the ransom to redeem us from our enemy. Our redemptive freedom allows us to respond with loving service toward Him. We do not serve under the shadow of fear of our adversary. Instead, we claim our sonship right of redemption and freely serve the true God in love. We were redeemed and delivered out of the hand of our enemy so that we can serve without fear—we’re free to serve in love all the days of our lives. Jesus Christ gave himself to the work of fulfilling God’s plan of redemption. He reconciled us to God that we might be a special group of people, zealous of good works. We have zeal in our hearts to give because we realize that so much has been given to us. When we work according to the Word with a zeal and a passion, we are fulfilling part of God’s redemptive plan for our lives. Hereby perceive we the love of God, because he [Jesus Christ] laid down his life for us: and we ought to lay down our lives for the brethren. Remember that hot summer day when I rescued my friend? I did knowingly risk my life, but it never crossed my mind to actually lay down my life for him. Jesus Christ loved God and knowingly laid down his life to pay for our redemption. He made a fully conscious decision to do so. We don’t have to sacrifice our lives as Jesus did by literally dying. Rather, as living sacrifices, we can lovingly lay down our lives in service for one another and glorify God, our heavenly Father. With an understanding and knowledge of God’s redemptive work in Christ Jesus, we are inspired and motivated to glorify Him in thought, word, and deed. Our redemption is the result of God’s loving-kindness, judgment, and righteousness. To understand and know our God-given right of redemption gives us cause to glory in Him, to speak of His loving-kindness, His judgment, and His righteousness. What? know ye not that your body is the temple of the Holy Ghost [holy spirit] which is in you, which ye have of God, and ye are not your own? Jesus Christ paid the price for our redemption by carrying out God’s wonderful plan. In response, we can live for the glory of God and do our utmost for His highest. We are sons of God, the Creator of the heavens and earth, and have been given so many rights and privileges out of God’s love. A greater understanding of our sonship right of redemption helps us have a greater appreciation for and response to His love. Redemption is the full and complete payment made for sin and its consequences, and we can rest confidently in the completed work of Jesus Christ on our behalf. What a joy we have to understand the reason for our redemption—that God loves us and desires our fellowship with Him. With this knowledge and understanding in our hearts, we can respond to our redemption by loving God and walking in fellowship with Him. Let’s rise up and serve Him unreservedly with hearts of love, thankful for the benefits of redemption and living our lives to the glory of our great God and heavenly Father. This is a reprint from the March/April 2009 issue of The Way Magazine.